I recently came across a machine where .NET Framework 3.5 wasn’t functioning correctly. It was needed as a prerequisite and the application was not recognizing it even though it was enabled in the “Turn Windows Features on and off” (Search for this on the Windows Start Menu). If uninstalling and installing .NET on Vista does not work you can run a command to scan and repair system files. Since .NET 3.5 is part of Windows 7 you can’t easily uninstall it. Try this command out and it should help if you actually have corrupt system files. Open a command prompt (CMD) window and make sure you ‘Run As Administrator’. (Search for CMD in your Windows 7 Start Menu and then right click CMD.EXE and select ‘Run As Administrator’). This can take a while but let it run. 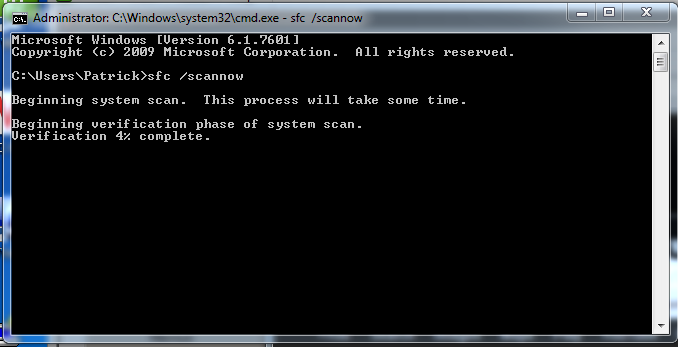 This will scan all protected system files and replace incorrect versions with correct Microsoft versions. Once it has completed reboot your machine and try again. This entry was posted in Technology and tagged .NET, Corrupt, fix, scannow, SFC, Uninstall, Vista, Windows 7 on July 11, 2013 by Patrick.